Born Karachi, Pakistan, 1938; BA, Mathematics, University of Dehli, 1957; Diploma, College of Education, University of Nottingham, 1973. 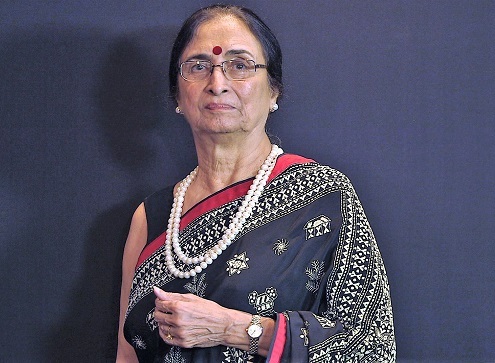 In this interview, Shamlu Dudeja—Founder of SHE (Self Help Enterprise) India and Chairperson of the Calcutta Foundation—narrates her inspiring story, beginning as a child in Pakistan on the eve of Partition, to her education and early career as a mathematics teacher, to ultimately founding a major women’s organization in Bengal. As Dudeja explains, both of her parents were instrumental in guiding her down her future career path. From a young age, her father—himself a mathematician at a college in Karachi —drilled her on arithmetic and multiplication. Dudeja’s mother taught her the art of Kantha—a type of traditional embroidery stitched into multiple layers of fabric, common in the Indian states of West Bengal and Odisha, as well as in Bangladesh. These two seemingly unrelated skillsets have driven Dudeja’s career. After spending many years as a mathematics teacher in Kolkata, she was approached by Oxford University Press about writing a series of math textbooks for ages 4-14. The books were a huge success, and Dudeja used the royalties from these and subsequent publications to fund the operation of her non-profit organization SHE (founded in the early 1990s), which simultaneously revived the dying art of Kantha and provided rural women with access to income. In the interview, Dudeja describes how the organization that became SHE grew from just a few women embroidering Kantha in their spare time to a complex network with trained seamstresses each training overseeing hundreds of talented women. Dudeja also discusses SHE’s unique organizational structure, how she ensures fair compensation, and how the group is adapting to the new ecosystem of online retail. Dudeja concludes the interview by talking about her broader commitment to social responsibility, as embodied in her work with the Calcutta Foundation and other organizations. She was recently recognized for her work by the International Folk Art Market, which awarded SHE Foundation the Community Impact Award in July 2018. Ian Skelly, "Embroidered Scenes," Resurgence & Ecologist, August 2012. "Stitching Up Dreams," Rotary News, August 2015. "A Kantha Revivalist Stitches Her 30-Year Story," The Telegraph India, October 2, 2016. Interview with Shamlu Dudeja, interviewed by Geoffrey Jones, Kolkata, India, April 27, 2018, Creating Emerging Markets Project, Baker Library Historical Collections, Harvard Business School, http://www.hbs.edu/creating-emerging-markets/.